The Cheshire flag has now been registered. See http://ukflagregistry.org/wiki/index.php?title=Cheshire from which I have cut and paste the following. I went to Chester this morning to find out about the flag of Cheshire. The County Council offices have been moved to the town of Winsford, several miles away and now a bedroom suburb of Manchester. However, the staff at the Chester City Tourist Office, (the former city hall) were very helpful. The Cheshire County Council flag apparently exists in two variants, one just with the shield and garb and the other with the lettering as well,. There doesn't seem to be any formal regulation as to which is official; I was told that apparently when the flags were first ordered after the local government reorganization in 1974 they did not have any lettering beneath the logo, but when a reorder took place sometime during the 1980s they suddenly appeared with the lettering. She said that she wasn't sure whether there had been any action on the part of the County Council with respect to this, or whether it was just a unilateral action on the part of the flagmaker (i e, somebody got it wrong and there was too much apathy and inertia to complain). I myself was too apathetic to go next door to the main library to check council records on microform as to this point. 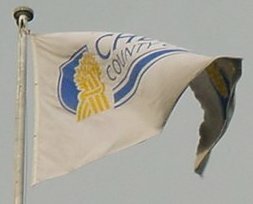 A white flag, bearing the logo of Cheshire County Council, which can be seen on their home page and each of the other main pages of their web site http://www.cheshire.gov.uk/aboutcheshire/Crest.htm. This particular page shows the Council's Coat of Arms, which states: "Cheshire is the only example in the United Kingdom of the county and the county town both possessing a complete achievement of heraldic honours." The wheatsheaf and shield on the Council's logo appear to have been taken from the Coat of Arms and restyled. Note from the photograph, the logo appears on both sides of the flag the correct way around, so it is a double sided flag. I find the use of a "logo" flag by the present county council of Cheshire rather sad. By definition, their coat of arms is also a banner, viz: Azure a sword palewise point in chief between three garbs or, and thus this is already the council's flag. Of course the so-called county council's administrative boundaries differ radically from those of the County Palatine; there is therefore a need for a flag to identify the people of the latter (rather than the taxpayers of this rump "county"), particularly those in the districts once annexed by Greater Manchester and Merseyside and now left county-less. It seems to me that the best design would be: Azure three garbs or, as used by the County Palatine since Earl Hugh Kyvelioc: I propose this as a regional flag for general use within the County Palatine of Chester. One of the alternative titles of the Heir to the English throne (I'm not sure if it also appertains to the United Kingdom as a whole) is Earl of Chester, and when Princess Diana was still Princess of Wales she opened the main hospital in the county in Chester. The hospital is named after her - it's the Countess of Chester Hospital.